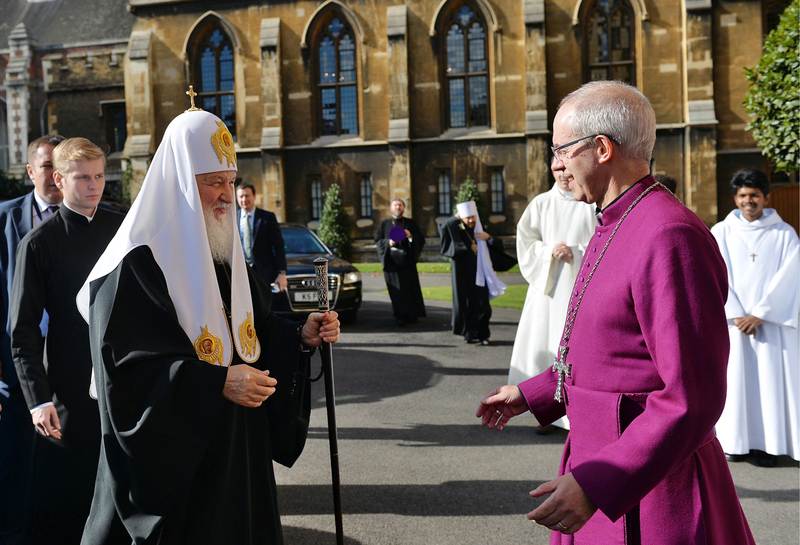 Patriarch Kirill (L) of Moscow and All Russia meets with Archbishop Justin Welby of Canterbury at Lambeth Palace on Oct. 18. Patriarch Kirill has paid his first ever visit to the UK, where he had a meeting with the Queen and conducted a service at a Russian Orthodox cathedral in London. While the head of the Russian Orthodox Church urged political significance not to be attached to his visit to London, observers saw it as a step toward improving relations with the West. Patriarch Kirill of Moscow and All Russia has concluded a landmark visit to the UK that has been hailed as an important step toward improving relations between Russia and the West. During his visit, which ended on Oct. 18, the Patriarch was received by the Queen and had a meeting with the Archbishop of Canterbury. “The Patriarch’s visit to London has a particular significance given the rising confrontation between Russia and the West,” said Roman Lunkin, the head of the Center for Religion and Society Studies at the Russian Academy of Sciences. “The Patriarch enjoys huge respect and influence not only in his own country but abroad too, so his meetings with foreign leaders have a positive effect on Russia’s relations with the West,” Lunkin said. When lay diplomacy runs into difficulties, church diplomacy can help restore relations, he added. “The Patriarch’s meeting with the Queen will not bring a dramatic change in bilateral relations between Russia and the UK but it will help improve Russia’s image in the West. Following the Havana meeting with the Pope and the Latin America trip, Patriarch Kirill’s visit to the UK highlights the openness and the international nature of the Russian church,” Lunkin continued. “We hope that this visit will bring tangible results for the development of relations between our nations since both the church and the monarchy are the foundation for preserving traditional values, which, unfortunately, are losing their significance in many people’s eyes,” said the head of the Moscow Patriarchate press service, Father Alexander Volkov. Patriarch Kirill started his visit to the UK on Oct. 15 to mark 300 years since the Russian Orthodox Church first appeared in the British Isles. Kirill’s predecessors had visited London before, but this is the first time in church history that a patriarch has paid an official visit to Buckingham Palace. After his meeting with the Queen, which was held behind closed doors, the Patriarch told journalists that he was “very pleased” with the meeting. As a souvenir of their meeting, the Patriarch presented Queen Elizabeth with a “Quick to Hearken” icon of the Mother of God, while the Queen presented the head of the Russian church with a portrait photograph of herself. The Church of England has the same state status as the Presbyterian Church of Scotland. Legally, the Church of England is headed by the ruling monarch, so the Patriarch’s meeting with the Queen could be seen also as a meeting of the heads of two churches. After Buckingham Palace, the head of the Russian Orthodox Church paid a visit to Lambeth Palace, the official residence of the Archbishop of Canterbury. His talks with Archbishop Justin Welby were also held behind closed doors. As the Patriarch said later, one of the main topics on the agenda was the plight of Christians in the Middle East. “Church is intended to reconcile people, to defuse tension, to be a peacemaking force,” said Kirill. “This is what we talked about with the Archbishop of Canterbury. We aim to work together as regards peacemaking, focusing on different hotspots.” He went on to say that the Church of England and the Russian Church had the same understanding of what the role of church should be when faced with a conflict. “Church is intended to make peace between people,” he said. “No visits by the Patriarch can remove the contradictions that exist between our countries,” said Kirill, though he added that he had not seen any hostile attitudes to Russia from the British people. The Patriarch also expressed the hope that Russian-British relations will withstand any trials thanks to “a centuries-old tradition”: “This includes dynastic marriages, a joint fight against a common enemy and cultural exchanges,” he said.